There is much cruelty in the ten stories that make up this collection of short stories. But rarely is it an overt act. Instead the cruelty is delivered with sly subtlety, the kind that makes you wonder, when you are on the receiving end, if perhaps you aren't just over-reacting. Perhaps you misread things. Perhaps the fault lies with you. So it comes as no real surprise that the victims of these cruelties receive their fate with a combination of bewilderment and matter of fact acceptance. Within these stories there is murder, suicide, kidnapping, there are lies, debasement, guilt. But in Munro's deft hands, these subjects do not take centre stage, as they would in an ordinary tale. Momentous though these acts may be, they do not serve as the plot. They are, instead, subtle catalysts for the story, stepping stones over which the characters move forward to find a greater truth. Like the mother who mourns her children in Dimensions, or the student who submits to abasement in Wenlock Edge, comfort comes to the characters from unlikely sources. And often as not, it's the main characters themselves who dole out the cruelty. Or worse. 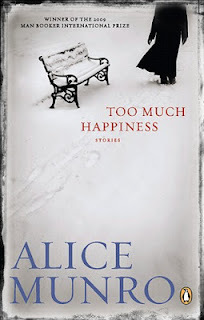 The stories in Too Much Happiness draw you in completely. It's all too easy to place yourself in these situations, to rationalize motives and acts. 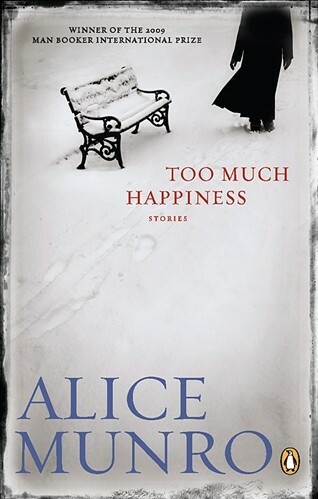 It's no wonder that Alice Munro won the 2009 Man Booker Prize with Too Much Happiness. She makes it all seem so effortless and so plausible. You won't regret checking this one out of the library, Rebelle.